Mari Inukai is one of the participating artists. Lunar New Year officially takes place Feb. 8, but starting this weekend, Giant Robot 2, 2062 Sawtelle Blvd. 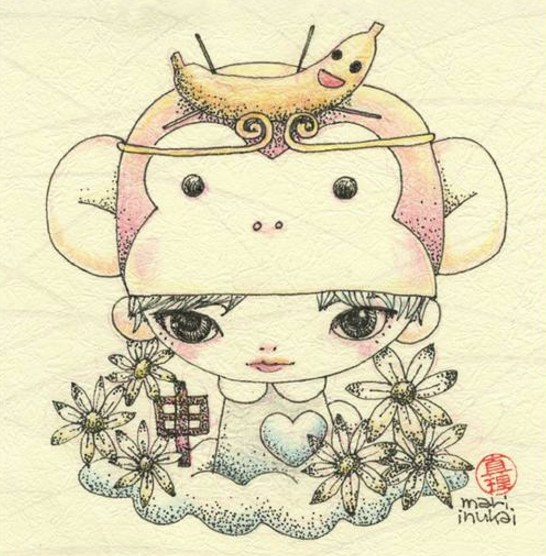 in Los Angeles, will celebrate the Year of the Monkey with a group exhibition. Opening reception with the artists will be held on Saturday, Jan. 23, from 6:30 to 10 p.m. The show runs until Wednesday, Feb. 10. Hours are Wednesday and Thursday from 12 to 6 p.m.; Friday and Saturday from 12 to 8 p.m.; Sunday from 12 to 7 p.m. Closed Monday and Tuesday. Featured artists: Aaron Brown, Alexander Vidal, Allison Cole, Ayumi Takahashi, Brian Luong, Caitlin Anne, Candie Bolton, Cassia Lupo, Christy Saguanpong, Dan Goodsell, Dan-ah Kim, David Horvath, Delfin Finley, Elliot Brown, Enky Skulls, Eric Nyquist, Flat Bonnie, Gary Musgrave, Heeyeon Chong, Jared Andrew Schorr, Jen Tong, Jeni Yang, Jerome Lu, Jesse Tise, Jisoo Kim, Junko Ogawa, Justine Lin, Katherine Chiu, Katsuya Terada, Kerry Horvath, Kevin Luong, Kwanchai Moriya, Leonardo Santamaria, Luke Chueh, Maggie Chiang, Mari Inukai, Martin Hsu, Matt Furie, Mike Lee, Ming Ong, Miso, Moira Hahn, Patrick Hruby, Risa Kogawa, Rohitash Rao, Sean Chao, Sean Norvet, Shark Toof, Shawn Cheng, Shihori Nakayama, Stasia Burrington, Tae Lee, Theo Ellsworth, Tiffany Liu, Yu Maeda, Yusei Abe. For more information, visit http://gr2.net/ or call Eric Nakamura at (424) 2GOROBO (246-7626).